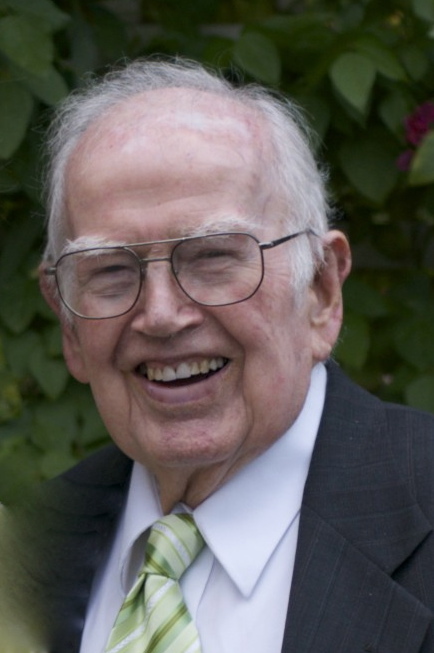 Thomas E. Wright of Mesa, Arizona passed away peacefully on November 4, 2014 at age 94. Tom was born in St. David, Arizona on January 31, 1920, the sixth child of Lorenzo and Theresa Hope Goodman Wright. The family established a home in Mesa where Tom lived most of his life. He was preceded in death by his parents and all his siblings; Beatrice Judd, Harold, Margaret DeWitt, Bassett, Bill, Jack and LaVaughn; two grandsons Preston and Nathan Smith and his eternal sweetheart and wife Georga Marie Kleinman Wright. He is survived by his adoring posterity, children Thomas George Wright (Marilyn), Linda Wright Smith (Edward) and Gary Lorenzo Wright (Marlene); 19 grandchildren and their spouses; and 58 great-grandchildren. To know Tom was to love him and to be loved. By profession he was a grocer in the family business, Wrights’ Markets. By practice he was a Latter-day Saint, serving a mission in the Northwestern States and in various callings. By nature he was a friend and servant to all. He served his country in the U.S. Air Force during WW II. He served his family, neighbors, friends and strangers. Although small in stature, Tom was a “Giant among men”, an honorable man without guile who will be greatly missed. Visitation will be Friday, November 14 from 6-8 PM. Funeral services will be Saturday, November 15 at 10 AM with visitation an hour prior. Both will be held at the LDS Beverly Ward Building, 1054 W. 2nd Place in Mesa. Rest in God’s Greatness and Peace Mr. Wright. My deepest sympathy goes out to all the friends and family of Thomas Wright. My sympathies to Tom’s family. I know him and most of his brothers. They were a great generation that blessed the lives of all they served. Their children and grandchildren continue in that same tradition. All my love for the Wright, grandpa Tom was so important for me and my family. We love our Wright family!! Grandpa Tom was a grandpa to all of us and made us feel loved!! We will miss him and that generation of amazing family!! So sad to hear of your father’s passing. Our prayers are with you and all of your family. A very exceptional family and I am grateful to be acquainted with many of the Wrights. Oh Uncle Tom you spread so much joy and peace in this world and now it’s time that you and Aunt Georgia spread that same peace and joy that passes all understanding right there in heaven with family and friends from before. It doesn’t get any better than that. You are truly missed and loved. Love this sweet man! So thankful for the amazing posterity he’s left here! I appreciate all my experiences with Tom. He was a pleasant and valuable missionary companion. He served the Lord with all his effort. I had the privilege of selecting my own companion for a special assignment. I didn’t know Tom at the time, but I recognized that he had the Spirit of the Lord with him. He had that Spirit with him all of his life. During the winters that I spent in Arizona, I often met Tom at the temple. I have fond memories of being invited and welcomed to the Wright Family Christmas party. Tom was a joy to know. What an honorable and respectful man we all knew in Tom Wright. May the family feel the comfort and peace they need at this time.